You wont find a new country, won’t find another shore. The city will always pursue you. 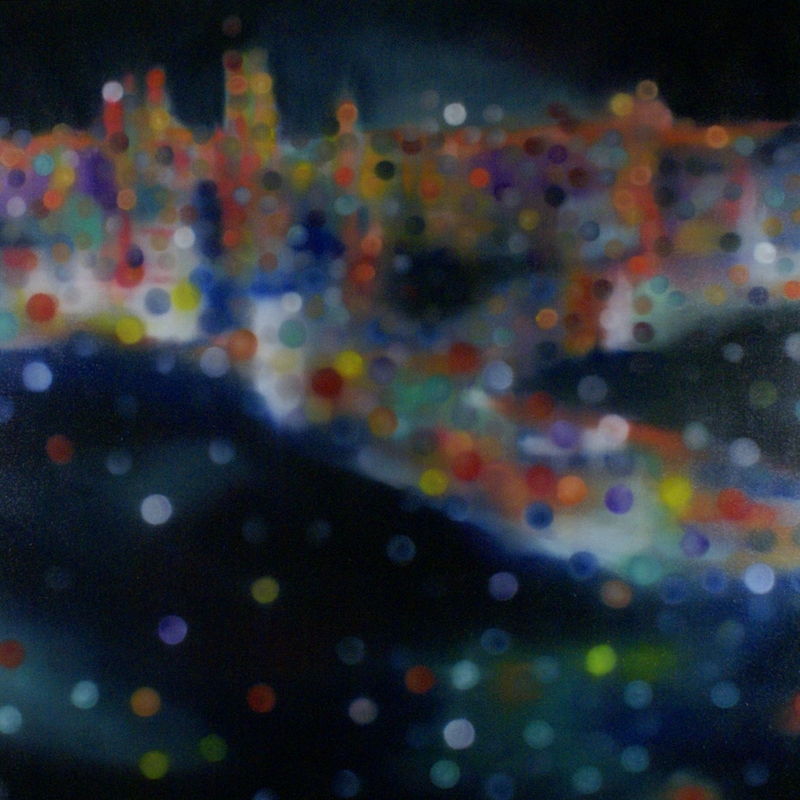 You’ll always end in this city…. The seduction of urban life has always been present in Benjamin Wener’s art practice. In his two most recent solo exhibitions, Show Ponies 2009 and the facebook 2008, Werner wove mythologies of pop stars with contemporary and colonial outlaws, and art world politics to explore social aspects of the celebrity, the criminal and cultural city life. In his new series of works, Suburban Sprawl, Werner continues to indulge this urban fascination though this time he has withdrawn from the daily hustle to find a quieter place to study the cities that continue to seduce him. 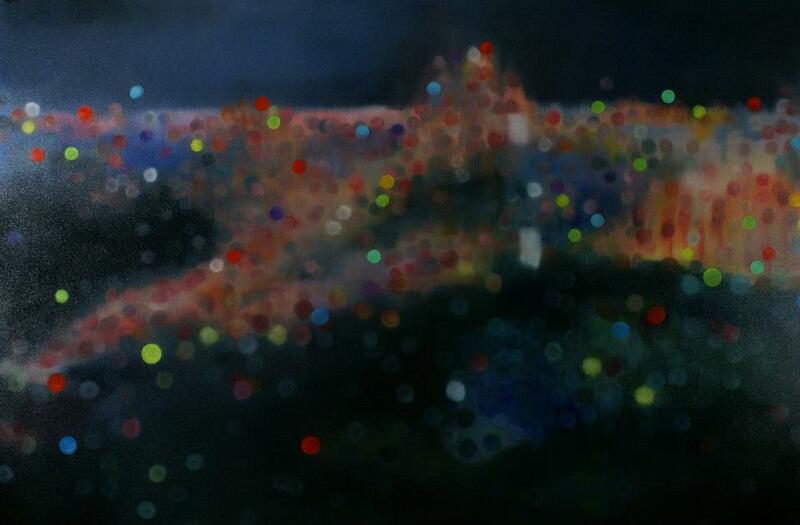 Suburban Sprawl is perhaps the most meditative exhibition from this Fortitude Valley based artist. 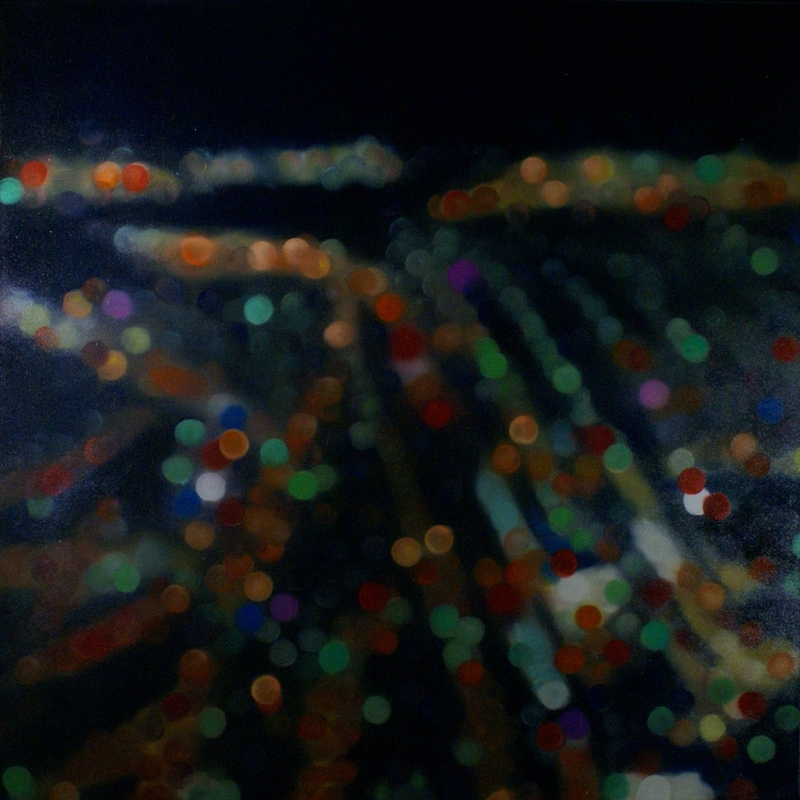 In this series Werner has painted the urban landscape – specifically nocturnal cityscapes from elevated viewpoints. These viewpoints include Mount Coot-tha and Mount Gravatt lookouts as well as Melbourne’s Eureka Tower. 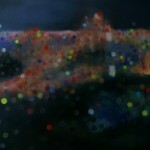 Werner has also captured many of these works in the rain to heighten the sensual effect of the city lights. The works are all painted in oil using a wet-on-wet technique before being coated in varnish. Werner has hidden colours in the undercoats of some of the works, which he delights in coaxing to the surface during the painting process. For example, in Suburban Sprawl #3, View from the suburbs a deep red pushes through the dark sky and suburban hills in the top right and bottom left. As an adolescent Werner spent many evenings looking out over the city from his local lookout spot. For many Australians who grew up in the suburbs these were sacred spaces. It was the place you could go with your closest friends to talk about your hopes for the future, and the most romantic of places to take a lover. The place you rolled uo to in an old car to look off into the distance and ream about how it could all one day be yours. It was the place that taught you to think, to see, to feel…to be poetic. There is a touch of romantic noir in Werner’s cities and it is this poetic darkness of the city at night that lends the subject so well to painting. Luscious syrupy blips and slow fireworks of light hum sweet and warm against the cold night air. We know they are moving but we are too far away to tell for sure. The paintings in Suburban Sprawl are reminiscent of an early scene in the David Lynch’s 2001 film Mulholland Drive. Emerging heavily concussed from a car crash on Mulholland Drive, Dana stands transfixed in front of the night view of Los Angeles. The bright lights of the city at first calm a confused Dana, and the gently guide her down the hill, calling to her like ancient sirens. Images of the night stir in us a seemingly universal feeling of longing and desire and it is these emotions Werner captures in his works.